Sample no. 5397 from the "Mineralogy and Petrography Museum Grigore Cobălcescu" of "Alexandru Ioan Cuza" University, Iaşi. Below spectra are various settings, and other vibrations of azurite (which are not present in this spectrum). The azurite spectrum is characterized by several lines that cover the spectral range 200-1600 cm-1. The bands observed up to 600 cm-1 are assigned to the translations of (Cu, CO3), those observed up to 1600 cm-1 are assigned to CO3 complex (Frost et al., 2002). The Raman spectrum of our azurite does not show the O-H stretching band at about 3400 cm-1. 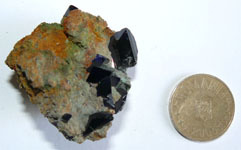 Azurite has a characteristic intense band at 404 cm-1. The symmetric stretching band of carbonate ion is observed at 1097 cm-1, this band is assigned to the ν1 symmetric stretching vibration. The band attributed to the carbonate (ν3) asymmetric stretching vibration is observed at 1425 cm-1 and 1459 cm-1. One band is observed in the Raman spectrum of azurite at 766 cm-1 and is assigned to the ν4 mode. The band of 835 cm-1 was assigned to the ν2 asymmetric bending vibration. A number of bands with different intensities are observed in the lowest spectral shift of the Raman spectrum of azurite (250, 285, 339, 404 and 544 cm-1). These Raman lines are assigned to the lattice modes. The O-H out-of-plane bending mode of azurite was reported at 939 cm-1. We have not found any information available for Raman line of 1579 cm-1. It is probably due to the O-H bending mode, in agreement with Nakamoto (1997).